It blows my mind how controversial this subject is. Every single time I post something about alcohol free drinks I get someone on social media telling me I’m “kidding myself” or “playing games with the devil”. I find it quite ignorant actually. The last comments were in relation to an image I posted of the wide variety of AF drinks available at Tesco. As I’ve said many times in my blog posts, I’m not trying to tell people what to do, or advise people. I’m simply writing about my own experiences and what helps me and it just happens that alcohol free drinks have saved me from relapse. I’m not playing with the devil or trying to kid myself. I was never a daily drinker and I never craved alcohol so by drinking something that contains less alcohol than orange juice or the vinegar on your chips I don’t think I’m doing myself any harm. I’m not going to tell anyone in recovery to try them and I never will. In fact, I agree that they probably aren’t good for someone who was a daily drinker and craves alcohol. 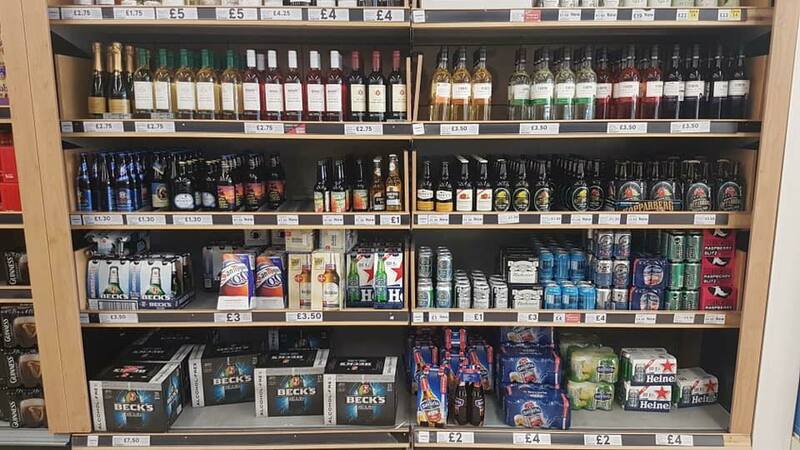 A lot of people have asked me where you can buy alcohol free drinks so I’m simply posting a photo showing how many are available at Tesco. In fact, I have friends that don’t have a drink problem who regularly drink them now to stop the Monday morning hangover, so I’ve probably done them a favour as well because they’ve never bothered looking in the past. I genuinely believe that everybody’s recovery is unique and we all have our own coping strategies. I know I would find it very difficult to socialise for a long period of time without AF drinks. In the beginning, part of my problem was being able to fit in and not look like the person with the drink problem and to a certain extent that’s still the case. Whilst I’ve got a beer in my hand nobody knows that it’s alcohol free and that stops the questions like “why aren’t you drinking” being asked. Many people tell me they don’t understand why I have an issue with this and that I should just say I’m driving but the fear of being asked is all part of my problem. I don’t want to be asked that question because I know the real answer is because I have a drink problem. I’d just rather not have to approach the subject in a social situation as it can be pretty awkward when people who don’t know me are around. It is getting easier for me to answer but I still do struggle from time to time. Also, I prefer to drink an alcohol free drink rather than Diet Coke all day! At the end of the day, some people like me NEED alcohol free drinks to stay sober. I am absolutely convinced if it wasn’t for them I would not be 329 days sober today. I’m quite happy to have a debate about alcohol free drinks but please don’t tell me I’m doing wrong by drinking them because I wouldn’t tell anyone how to continue with their recovery. Next Going sober for October? Hi love your honesty well done, you are right it is a highly emotive subject. Personally I cant go near them and know that they would be a slippery slope to a relapse. I guess my only comment to you might be to looking into that fear. Are you afraid of letting go of your old life? What drives that fear. All just suggestions of course.